The debate to push for more poker machine restrictions continues despite the Labor Government announcing a comprehensive plan to regulate, tax and further limitations on poker machine operations in Australia. The report and study simply examined poker machine expenditure levels against population levels and income levels for adults who live in areas for which the poker machine expenditures apply. It examined the level of community benefits reported for clubs for those areas. It’s a high level “desktop” study taking data from various sources, manipulating the data and calculating a number of ratios. There was no consultation or primary research undertaken as a part of the study, but simply an analysis of some numbers. This is not meant to be a criticism of Dr Livingstone or his work. But if Dr Livingstone is going to make the bold statements in a Monash University report, surely his study should be examined in more detail. It’s dangerous for an academic, under the brand of Monash University, to make the statements that Dr Livingstone made without proper justification. The academic environment has safeguards on this through the peer review process. This report doesn’t appear to have been reviewed to any great extent and contains some notable flaws. Dr Livingstone’s analysis uses resident adult population levels for the areas examined. This then assumes that all the poker machine expenditure for an area is attributed only to that resident population. But what about areas like the Gold Coast. The study looked at the electorate of Moncrieff, for example, which is based on the Gold Coast. The adult population for Moncrieff is reported in the study to be close to 116,000. But the Gold Coast is host to over 20 million visitor nights each year from domestic and international tourists, not to mention the enormous number of day trips made to the Gold Coast every day. Surely it would have been better to make these adjustments for each of the areas, especially considering the major conclusions drawn. 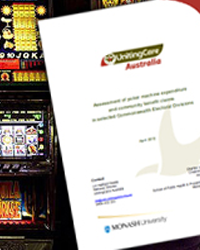 The poker machine expenditure used in the report is drawn from machines in clubs and hotels. The community contributions data are taken from in most cases clubs only. In the case of Queensland data, the total value of community contributions is taken from clubs with 51 machines or more because smaller clubs aren’t required to report on contributions in Queensland to reduce administrative burden. Table 2 on page 13 of the report sadly then assesses Queensland contributions as 2.3% of expenditure. But this is clearly misleading and wrong. If Dr Livingstone wanted to inform the debate as he states in the report, he really should get his numbers right. It must be asked what Dr Livingstone is comparing poker machines with in making his conclusion that “poker machines provide an extremely inefficient and high cost method for funding sporting and charitable activities.” Normally a reliable piece of research would then examine and compare other models of sporting and charitable funding. I’m not sure whether Dr Livingstone is comparing poker machines with raffles, art unions, street collections (now illegal), telephone touting or begging? A more complete and balanced study might have examined the social benefits associated with the provision clubs. When I moved to Sydney in 1988 and became a member of Harbord Diggers at Manly, I was astounded that I could join a club and have access to the services and facilities that club offered. Brisbane had no such facilities back in 1988. The study takes no account of the social benefit that many clubs provide through the range of facilities provided. So how then can Dr Livingstone draw these conclusions? Dr Livingstone’s study might have been more extensive before the conclusions were made. This is especially so for members of the academic profession who use their university brand to underpin conclusions that are not properly researched. A more complete and balanced study might have acknowledged the employment and economic activity associated with clubs. It might have acknowledged the hospitality and management training that occurs in the venues; training and development that would not have otherwise occurred. Dr Livingstone would have read the Productivity Commission’s reports (Gambling Inquiry Report Vol 1 & 2) that acknowledged many of these benefits, he would have also read the IPART (Review of the NSW Registered Club Industry) report that acknowledged the benefits of clubs and the funding that poker machines generate in NSW. If clubs are to wear the burden of additional regulation and this regulation is justified by research undertaken by members of the academic profession like Dr Livingstone under the insignia of public universities such as Monash, then surely they are under a professional duty to do proper, balanced research. DWS can assist your club with a Community Benefit Plan to maximise the benefits of your community contributions that will exceed the expectations of both society and Government bodies. Contact Geoff Wohlsen today.